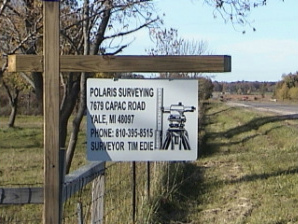 Polaris Surveying, PLLC has been serving the land surveying needs of Yale area customers since 1996. Our abilities include boundary surveying, land surveying, elevation certifications, ALTA surveys, construction staking, site plans, LOMAs, mortgage surveys and more. We offer free quotes and have an excellent staff that’s ready to answer any questions you may have. Survey data plays an integral role in a number of situations involving land ownership. From buying and selling land, to insuring property, to developing and beyond, before you do anything with your land, it’s critical to hire a knowledgeable surveyor in St. Clair County, MI. Polaris Surveying, PLLC is ready to be your first choice, providing a full scope of surveying services, backed by decades of tenured experience. We strive to provide our customers with nothing short of the most accurate, thorough data, so they can make informed decisions about their land. Whether residential or commercial, we welcome surveying projects of all scopes and sizes. As a reputable land surveyor in St. Clair County, MI, we also have experience working hand-in-hand with developers, contractors, real estate agents and more, providing tailored surveying data for specific applications. Whether you need construction staking for your development or are applying for a flood elevation certificate, we’re able to help you through the process smoothly. Our familiarity with the Michigan landscape makes us the premier choice for things like elevation and topographic surveys, and our extensive training shows through in services like boundary surveying and site planning. Contact us and see our expertise in action for yourself the next time you need reliable survey data. We employ only registered surveyors and engineers. We’re also affiliated with the Michigan Society of Professional Surveyors (MSPS). We’re a locally-owned company, proudly serving Yale, MI and the surrounding counties, including Sanilac, Lapeer, Macomb and Oakland Counties. Our business has been in operation since 1996, backed by experienced industry professionals. Owner Tim Edie, PS, is a proud graduate of Michigan Technological University. We proudly provide prompt service and free quotes, backed by high quality service. Whether for real estate, new construction or preservation, precise surveying is critically important. Contact Polaris Surveying, PLLC today for best-in-class surveying services.